In many ways, these years were the "Golden Age" of Dormphone. 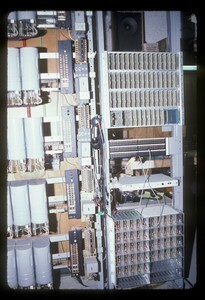 The small switching system located in Baker was consolidated into the Ashdown system. New dorms were built in the West Campus, with corresponding additions to the switching equipment in Ashdown. Most important, however, was the advent of direct interconnection between the Dormphone system and the Institute telephone system provided by New England Telephone. Since MIT did not want the time and expense of sending phone bills to students, only credit card and collect calls could be originated, and only paid calls could be received. To ensure that no collect calls were accepted, a recording was inserted on all incoming calls that said, "This is MIT. Collect and third party calls are not accepted at this number." The apparatus to perform this task was designed by Dormphone personnel. The announcement machine, commercially made, was the most modern device to ever grace Dormphone; it used digitized speech stored in 64K RAM chips. The interface cards and announcement device are shown in the photo at left. 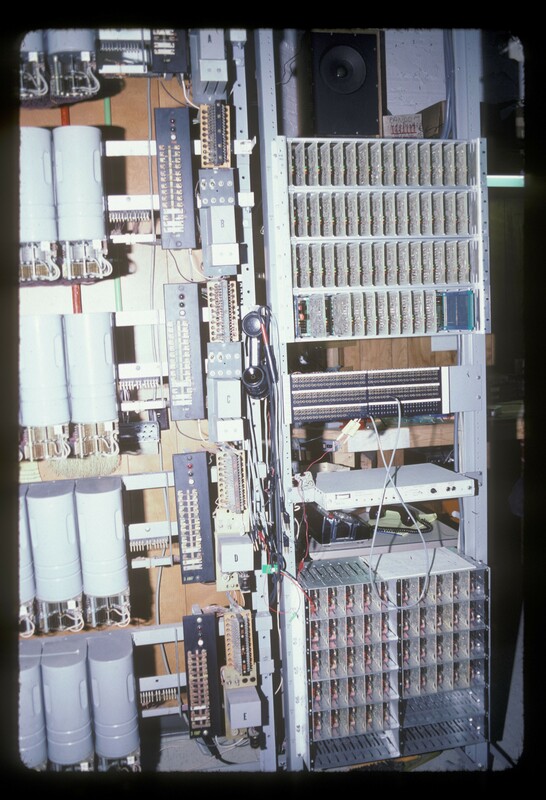 Two other thoughts come to mind: 1) The sound of New England Telephone system (1A ESS) calls coming into our switching equipment was very impressive - maximum speed, perfect dial pulse strings, with only 600 ms interdigital delay. 2) In its early life, the ESS crashed several times, sometimes for over an hour. Various MIT administration people demanded that "reliable telephones" be installed in three or four critical offices on campus. Dormphones, served by our ancient equipment, were installed!